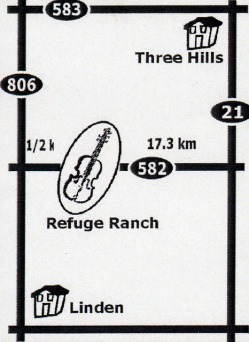 God has given the Gospel Troubadours Prison Fellowship stewardship of a 20 acre facility that is known as Refuge Ranch. Located north of Linden Alberta, the Ranch has facilities for overnight stays, a dining hall for food preparation and banquets, a chapel, and a large dry campground area that has water and power hookups available. There are spots for RV's that have electrical service and lots of room for general camping. Have a bonfire and sing-along around the fire pit. A highlight function at Refuge Ranch is Gospel Music Day on the second Saturday of each month. Click on Activities and News for details. The chapel comfortably seats 200 people and has a P.A. system that is adequate for most gatherings. You're welcome to come and stay at the Ranch. The facilities are available for rent. Please call (403)-546-4390. Come and visit us at the Ranch. It's available for Picnics, Camping, Banquets, Family Gatherings, and Church Functions. Here's a map of how to find us. It's really easy and there is a big sign at the driveway.